Ahead of our dance night commemorating the amazing women of music, Mike 2600, Mina Moore (YSHEYELLIN), and DJ Ms. Brit answered a few questions about what to expect at this Friday’s Wonder Women event. You can read their responses below and get hyped for one of our premiere dance parties of the summer on Friday, July 28 in the Mainroom. 1. What does it mean to you to be a part of this tribute to influential female musicians? Getting to play all of these huge songs from some of the most powerful performers that planet Earth has ever witnessed inside one of the greatest nightclubs planet Earth has ever hosted is nothing short of an honor. For me, this night will be all about nostalgia and playing music that makes people feel good. Being a part of this tribute feels really good. I’ve been given an opportunity to share my love for my “aunties” with my city. Anyone that knows me (or has been at an after party with me) knows how much I love to play dance and soul music. Now I get to take that energy from my living room to the Mainroom. I’m into it. There are so few spaces that amazing women are celebrated, and even fewer spaces where we can celebrate women that aren’t currently on Billboard. To be playing and celebrating all the women who empowered me to do what I do in the first place is really a treat. 2. Have these women influenced your career in any way? How? I’m from the early MTV era, so growing up watching videos from Madonna, Janet Jackson, Cyndi Lauper, En Vogue, Queen Latifah, and Salt N Pepa was a huge part of my upbringing. Their songs, videos, and personalities were exciting and captivating, and their songs are still just as huge today. As a DJ, it’s important to play big songs that resonate with an audience. The songs of these Wonder Women are so fun to play for an attentive crowd to watch them immediately snap back to their own childhoods. Fun Fact- At 4 years old I made a music video to “I’m Every Woman” (The Whitney Version) and I really believed that ish. Women come in all shapes, sizes, and have different interests, and that’s okay. I’ve never felt like I had to fit into a box and Whitney is a big reason why. Sade taught me about quiet confidence and simplicity. Janet showed me the possibilities of evolution sonically, stylistically, artistically, and sexually. It’s a gift to bear witness to women who are unapologetically themselves. 3. What should we expect for your set? What are you most excited about playing the Mainroom? I’m pulling a ton of songs from a pretty diverse range of artists. Aside from most of the artists listed on the flyer, I’m excited to play big hits from Diana Ross, Mary J. Blige, Stevie Nicks, Cherrelle, Chaka Khan, Grace Jones, Lisa Lisa and Cult Jam, and even Luscious Jackson. Expect to get turned up in ways you forgot you knew how. Think everything from classic hip hop to Brazilian sambas. Most excited about playing RuPaul. Lots and lots of RuPaul. I want to set the vibration in the room through some vibey Sade, Jill, and Solange. Then turn up the energy with a little afro-beat, reggaeton, and funk. I want to leave some room for spontaneity but I’ll say this: expect to feel good, expect to groove, expect to dance. It’ll be an amazing night. 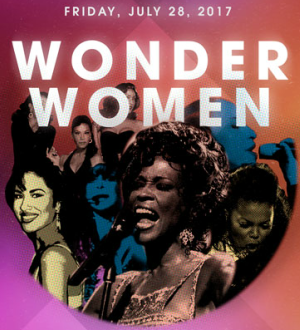 After hearing from our DJs, it’s impossible not to be excited for Wonder Women on Friday. Get your tickets now!